Australians from all walks of life have begun to realise the nation’s cities cannot sustain profligate growth indefinitely. Dwindling water supplies, failing food bowls, increased energy costs, more severe bushfires, severe storms, flooding, coastal erosion, rising transport expenses, housing shortages and environmental pollution are now daily news headlines. Australia’s cities may have reached their ecological limits: a new model for planning the places we live is needed. Understanding the natural cycles of the city is just as important to planning our cities as knowledge of local ordinances, indeed much more so. A profound knowledge of environmental processes is critical for successful planning in today’s world. Environmental planners take as their guiding principle the concept of designing with nature, approaching cities as living organisms that consume water, energy and raw materials, and produce waste. This metabolic view of cities means we can find new solutions to old problems, and steer our cities towards a more sustainable form of planning. 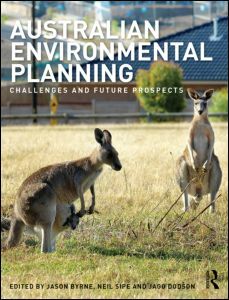 Written specifically for students and professionals working in city planning in Australia, this ground-breaking new book enables Australian planners, architects and developers to get a better understanding of the fundamental principles of environmental planning for cities, showing how land, water, air, energy, wildlife and people shape our built environments, and how in turn environmental processes must be better understood if we are to make informed decisions about developing cities that are more sustainable. The book’s coverage is comprehensive: from an overview of the concepts and theories of environmental planning, through analysis of governance systems and urban environmental processes to agendas and policies for the future, all the key topics are covered in depth, with recommendations for supporting reading and an unrivalled selection of additional materials. Ideal for students, essential for professionals, Australian Environmental Planning is vital reading for more sustainable cities in a more sustainable world.